One-sentence summary: The early months of the First Crusade (1096) are seen through the eyes of Tancred, a young nobleman eager to save his soul by 'freeing' Jerusalem. Do I like the cover? : I do -- the image certainly evokes the Crusades in my mind. First line: The stars changed their courses the day that Tancred the marquis tossed aside his sword and strode off the field of battle. Did... I love the map and four-page list of characters? : YES. It made things much easier! Did... I find myself wiki-ing things non-stop, because I learned so many interesting bits of Crusade-y trivia? : YES. Books like this are wonderful because they make real historical eras that were far-off and fuzzy to me. Buy, Borrow, or Avoid? : Borrow if you like a meaty historical and don't mind beginning a new trilogy. Why did I get this book? 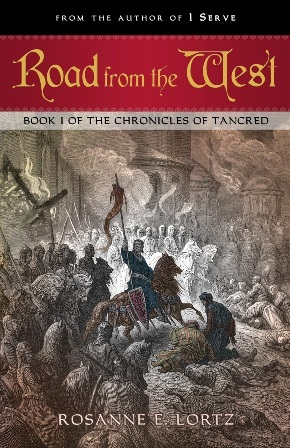 : I love fiction set in the Middle East and I'm interested in the Crusades. Review: Beginning in 1096, this novel covers the very start of the Pope Urban's First Crusade (the subsequent two novels will play out the rest of it, presumably). Written in a straight-forward manner, Lortz follows the exploits of the young nobleman Tancred, nephew of Bohemond of Taranto. The characters, sadly, were flat, and I felt very little connection with any of them, including our hero Tancred. Despite having a lightning bolt revelation about his role as a Christian soldier at the beginning of the novel, his development seemed to halt after the first thirty pages. His zest for fighting is clear and we get plenty of that, but his mental state, his feelings about himself or the Crusades, his faith, his friendships, none are considered or explored in anyway that compelled me to care about him or the Crusades. Lortz created two female characters but both felt a bit throwaway and underdeveloped as well. This book suffers from being too accurate. (I can't believe I'm saying that!) Lortz literally recounts (it felt) every skirmish that occurred historically, but the scenes lacked a frisson of tension and the thrill of daring strategy. To be honest, I started to dread each new city the crusaders arrived at for there would be another siege. While each episode might be differentiated by a quirky historical detail - a betrayal here, a hilarious interlude there - this novel felt interminably long in that sense and the usual payoff, an arc of change in a character, didn't materialize. One thing that jolted me out of the story was Lortz's use of very specific idioms and phrases that seemed inaccurate or out-of-place in the story. For example, a character says someone 'doesn't give a fig' about something while another utters 'by my troth'; a quick search indicates these phrases both came about in the 1500s. Later, we get 'there's the rub' (16th century) and 'gist' (17th century). Granted, the entire novel is written in Modern English but something about these well-known words and phrases struck me as anachronistic. Otherwise, I found Lortz's writing quite readable and she doesn't bog the narrative down in lots of explication (no long descriptions of war machines or how to saddle a horse, etc.). There's promise of a great historical novel here and I'm interested in seeing how Tancred's story unfolds. The Author's Note promises that one of the female characters gets more coverage in the second book, which makes me happy. If you're in the market for a new historical trilogy that is detailed without being overwhelming, give this book a try. For other reviews and guest posts from the author, check out the blog tour. I'm thrilled to offer a copy of Road from the West to one lucky reader! To enter, fill out this short form. Open to US/international readers, closes 9/23! For another entry, be sure to come back on 9/16 for my interview with the author! I am a big historical fiction lover, so this book interests me. I am not sure what to make of the characters that were hard to relate to, and I wonder if I would feel the same way, but the idea of the history behind this book sounds very fascinating to me. This was a very balanced and fair review, I think, and I am glad you mostly liked it! @Heather: I see a lot of potential in this book so I am looking forward to books two and three, and hopefully Lortz flesh out Tancred and co. The history is great -- I don't know about others, but I sort of conflate the crusades in my head so it's fascinating to read about THE first one -- and then to remember we're talkin' 1096 -- it's mind boggling! @rhapsodyinbooks: I never thought I'd say that, but there you go -- I could have used some glossing over of the campaigns in favor of more time developing the characters. And I definitely didn't need that much siege-ing. Too accurate? That's not something you hear every day! Haven't read anything about the first crusade so this sounds interesting. One thing I've learned from being a part of the book blogging community is that I enjoy historical fiction more than I expected I would. I don't think I like it enough for this book, though or maybe it's just that this type of book isn't for me. It sounds almost like a test book. I shudder to think how I would feel while reading it if you, a major fan of historical fiction, felt dread with each new city the crusaders arrived in! I enjoyed your review as always but that's as far as I'm going to go with this book :o) Thank you Audra! I have to agree with you Audra. While I did enjoy some of the siege scenes I wanted more about the characters. To flesh them out a little. I don't think it was that they were hard to relate to - there just wasn't enough there to really find a solid place for them in my mind. They weren't ones you would hold onto forever. Great review. Sounds like an interesting book, and I love when you go do research on your own because of a fiction book, but the Crusades and I do not get along.